Hello Friends!!! Here is the 5 best program to hide windows while doing you are at work place doing something apart from office work and your boss comes near you. How many times have you been doing work on your computer and didn’t really want anyone to see what you were doing? Maybe it’s confidential financial data or far-out website that would freak other people out. Whatever the case may be, it’s sometimes really useful to be able to quickly hide windows or running programs, which means making them vanish from the desktop or disappear from the taskbar. In this blog, I will mention five of my fav. FREE desktop hiding, application disappearing programs. ZHider is a very good program for instantly hiding windows and programs with a single keystroke. It’s super tiny, so doesn’t eat up a lot of RAM and it removes the program from your desktop and from the taskbar. The other cool thing about the program is that it loads up in super stealth mode, which means there is no pop up windows, sounds, and not even a system tray icon. No one will know it’s running and you can access all the options via keystrokes. There is even a crazy option called Task Manager Stealth which will hide the hidden programs from showing up in Task Manager under Applications and Processes! Definitely very useful. 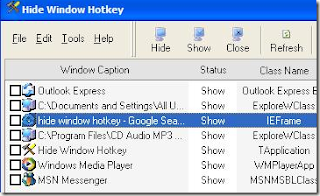 Another free program to hide Windows applications is Hide Windows Hotkey. You can setup to hide all windows instantly or just certain programs. What I like about this program is that you can setup using keyboard hotkeys or mouse hotkeys also! Other nitfy features that make this program cool are password protecting the hidden windows and muting all sounds from windows that are hidden. The latter can be very useful if you have a window open that has sounds coming through and you want to hide it, but also mute the volume. 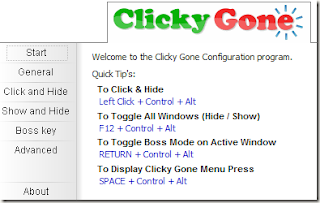 Another new app on the market for hiding programs is ClickyGone. It’s a very simple to use and effective program for hiding programs from nosy bosses or pesky family members. You can hide the active window or all windows using the keyboard and hide them completely or shrink them down to the system tray for easier access. It also does a very good job of hiding windows that may popup from an already hidden window, i.e. a task completes and a window pops up to display the message. 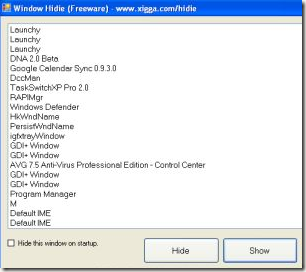 Not as advanced as the other tools mentioned, Window Hidie is a simple and very tiny utility for hiding windows. Basically it displays a list of applications and lets you click a button to hide the window completely. It does have a few keyboard shortcuts to hide all windows or just the active window, so that’s good. It doesn’t really have any other features. Hide is another simple, yet useful window hiding application. You can create program groups which allows you to hide/show multiple windows with one keystroke. You can also password protect hidden windows. So that’s about it! Five useful programs for maintaining your privacy wherever you are. If you don’t like all these programs, you can also check out my post on how to hide your desktop using built in Windows features. Enjoy! Thanks for reading, Leave your comments. Into blogging and working as a system administrator.